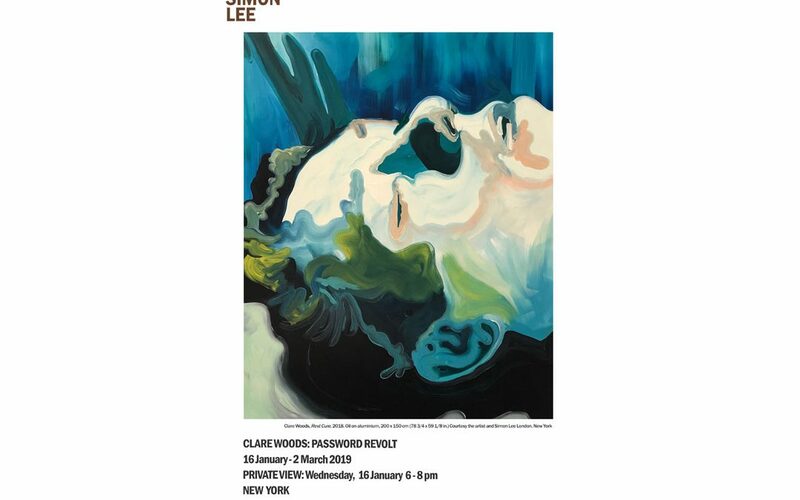 Solo exhibition, Password Revolt, opens at Simon Lee Gallery, New York, Wednesday 16th January 6 – 8 pm and will run until 2nd March. Over the course of a career spanning more than twenty years Woods has developed a unique painterly language that is concerned by the sculpting of an image in two dimensions. Her early practice as a sculptor continues to inform her exploration of physical form via the materiality of paint. A preoccupation with large-scale landscape painting has given way in recent years to a focus on the human figure rendered in oil paints, as opposed to the enamel originally used. The unpredictability of viscous oil on aluminum echoes the corporeality of her subject matter, helping the artist to engage with her medium on a physical level, while allowing her to confront, almost tangibly, the emotional range of her source material. Woods derives inspiration from found photographic sources such as newspaper clippings, magazines, and other diverse sources of visual ephemera that depict unsettling, disturbing and often transgressive imagery. An astute chronicler of personal and historical trauma, she attempts in her painting to process the effects of grief, disappointment and cruelty even as it cryptically depicts those subjects. Straddling abstraction and figuration, lived experience and cultural memory, these paintings point to a more emotive mode of representation. Acute psychological states are portrayed through the nuances of Woods’s gestural approach to painting, which defamiliarizes the familiar and expresses strangeness through expansive, vigorous brushwork, compositional distortion and abstract color. In this recent body of work Woods confronts the experience of living and the ways in which we cope with the adversities of the human condition. The paintings offer an open-ended view of social and political histories marked by a fluctuating approach to abstraction and figuration. Opening up the space between photographic portrayal and individual sensation and memory, Woods creates a new type of representation that holds the tension between what she sees and experiences in the act of mark-making. Shifts in scale emphasize human presence, pulling the viewer backwards and forwards and helping them to engage with the static object. Woods’s enigmatic imagery invites an interrogation of hierarchies of authenticity and questions what it means to be human in an ever evolving political and technological time.